I wanted to review this one now for a couple reasons... one, it's been sitting in my fridge for well over a year now. Two, i feel like i have been phoning it in with boring reviews lately cuz i have nothing to say about the root beers i have reviewed lately, but this one comes from a really cool place i will talk about shortly. And three, my wife was supposed to bear our first child two days ago. Sadly, he's turtling and refuses to come out, making my wife increasingly miserable as he's just getting bigger the longer he stays in there. I swear we're going to have to pull him out by his feet while he maintains his kung fu grip on my wife's uterus and fights leaving his now cramped confinement. So what does that have to do with this root beer? Well although it's called Surf City, it is made at a place in Huntington Beach, CA called Brewbakers, and to me, that sounds like Babymakers. It's a stretch, i know, but sometimes my writings are desperate for clever, even poor showings like this one. Anyway, Brewbakers is a cool little spot in Huntington. I learned that they had their own root beer and thought it was a restaurant, but when my wife and i went there with some friends of ours last summer we found that it really wasn't geared toward being a restaurant. 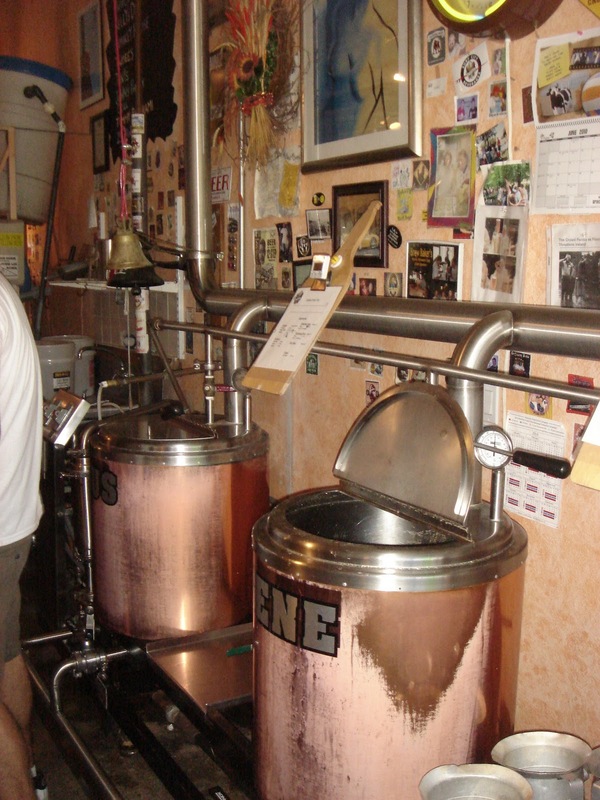 They did serve some food items (bread, pizza, pretzels and the like), but what draws customers there is the opportunity to individually brew their own little batches of beer (or root beer) using ingredients and recipes on hand. It was a really neat idea, and had we known we would have booked the time to actually make some Surf City ourselves. I have posted some pictures of the inside of the place, which is quite small but very neat. There is basically just a long table in the middle of the room right when you walk in with a lot of bowls and weights and measures on it. Below the table are cabinets with large bins of ingredients; grains, flour, sugar, etc. Along the right wall are several small kilns. Not sure if that's what they call them, but it's where the batches are brewed. 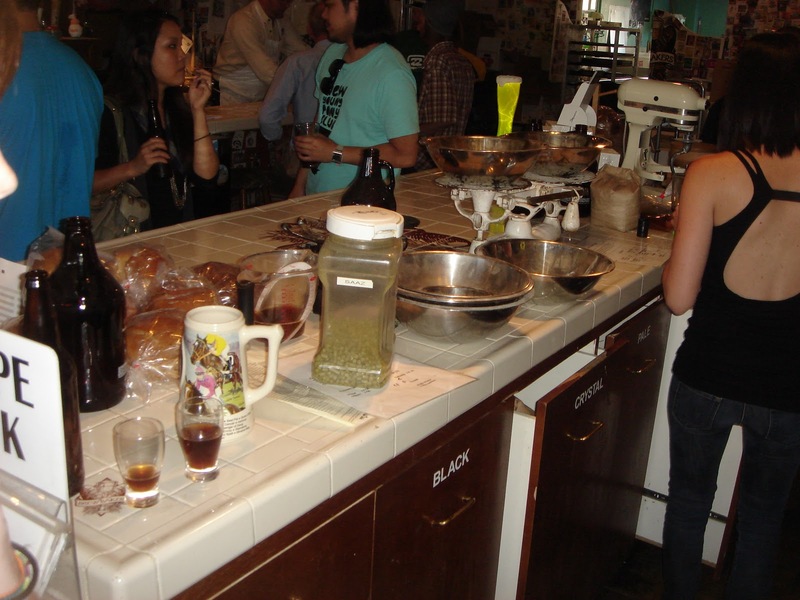 To the left of of the counter is the cash register and bottles of different brews for sale. I would totally book the time to brew my own batch next time i'm in Huntington cuz it looks like a fun little evening activity to do with friends. As you can see from the pictures, it was pretty packed for how small the place is. Needless to say, this place is pretty popular. 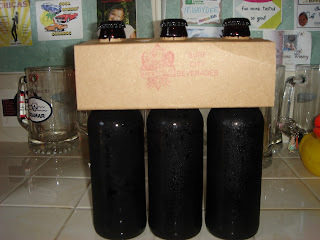 The bottles are dark brown 12 oz. glass with no labels. The label you seen the one in the picture at the top is another one of my hack photoshop jobs. We bought two 3-packs because there were 4 of us and they don't specifically have 6-packs. Regardless, we got what we came for. They do other flavors as well, including a sarsaparilla, but i don't review those even though we did drink a couple. As far as the label i put on there, it's the logo of the soda line they create at Brewbakers. However, the other cool thing about the place is that you can actually design your own labels that go on your brewed batch. So if you decide not to go by a recipe on hand and make your own concoction and want to bottle and label it afterward, they are all set up to allow you to do that. Pretty cool set up. We were impressed. As far as the taste goes, it's pretty good. It has a really nice aroma when you open the bottle, not much carbonation (although it HAS been sitting in my fridge for a year and i'm not sure the seal on the bottle kept it all in), and it doesn't taste like a cheap generic or a natural brand or anything. It's made with real sugar and is fairly sweet, and i can taste the anise which i don't normally care for but don't mind in this case. It's not an overwhelmingly obvious root beer taste, but it definitely works. By no means bad, and i think had i brewed it myself i would have enjoyed it that much more. My official review is that Surf City gets 7 (seven) IBCs. I'm not particularly blown away with the taste. It's good, but not outstanding. But i must say most of my rating is applied toward the unique nature of the endeavor and the fact that is can be customizable and changed with each batch based on the taste preferences of the one making it. If you're ever in Huntington, look this place up. I'll definitely book some brew time next time i'm there. Here's a root beer from the east coast, brought to me by a friend of mine currently residing in North Carolina. Harris Teeter is a grocery store chain in the south east United States, and this is their brand name root beer. There is no site specifically dedicated to the root beer, but here is the website for the grocery store (if any of you really care). I don't really have much to say about this root beer's origins and beginnings, so maybe i will talk about my friend in NC instead. He's a dentist with the navy right now and keeps asking us to fly out there and visit, but we simply reply that for the same price we could fly to Hawaii and stay with my wife's cousin. So basically, he now has to sell us on the idea that NC is better than Hawaii. Granted, i've already been to Hawaii and have never visited NC, but it's still kind of a hard sell. And since he's already scoured the area over there for root beers to send me, that avenue has been closed off. Sorry Richard. Looks like we're gonna save our money. But you're more than welcome to come visit us if you'd like. Except you can't stay with us. We don't have room for you. This root beer was brought to me in a 12 oz. can, but i am betting you can probably get it in a 2 liter bottle if that's what you prefer. The label is pretty typical for a generic brand; brown color scheme, simple design, lots of bubbles. It has kind of a cartoon quality to it, with pretty below average sketches of root beer mugs. But again, i can't fault them too much for lack of good design since the objective of a generic brand is to make a product as cheaply as possible. As far as taste is concerned, i again don't have much to say. I'm at the point where i've tasted enough root beers to make it hard to pick out what makes one distinguishable from another unless it's obvious. But as is standard of generics, it tastes like this root beer is copying A&W. Good carbonation, standard taste, typically generic. It's probably really inexpensive though. My official review is that Harris Teeter gets 5 (five) IBCs. Even though it tastes good, it's so unoriginal that i can't in good conscience give it anything higher than a 5. And again, i don't have much else to say, so i think i'll just leave it at that. I should have written this review a while ago when i went to dinner with my wife and some friends of ours. BJ's is a restaurant and brewery which brews its own beers. It's a franchise, so there are several of them around, and there is a large dining area as well as a sports bar area for people just looking to try their brews. It was started in California in 1978, but the food and atmosphere seems to have a Chicago influence (i was probably tipped off by the fact that the BJ's logo says "Chicago style pizza" at the top of it, although i am still keenly observant without that little bit of help). It's not terribly expensive and i think everyone in our group that night really enjoyed their meals. But ultimately, i'm here to talk about the root beer. So let's get to it, shall we? The root beer was served in a large glass mug, as seen in the picture. Please note, i have taken to editing pictures of root beer where no logo is present to include a logo. This is the case for the picture in this post. I don't know the dimensions of the glass, but i was free refills, so that's kind of irrelevant since once you commit to having root beer with your meal, you swim in it for all the restaurant cares. I like the whole root-beer-in-a-mug experience, but my only complaint is that it wasn't a frosty mug. A minor pleasure i concede, but i like seeing the frost on the mug when it's delivered and all the fun and excitement that accompanies that experience. I believe A&W drive-ins do the frosty mug, but it's been a while since i've been to one. All i will say is that any place that serves root beer in a mug that isn't frosty should reconsider their business model. Put the fact that it's in a frosty mug on the menu and i guarantee sales will increase exponentially (*note* all guarantees expressed in this blog are opinion based only and cannot be relied upon for future business projections whatsoever). I won't comment on the BJ's logo except to say it's fine just fine. It's technically the logo for the restaurant anyway, not the root beer, and what do i care about restaurant logos, right? So is this handcrafted root beer worth the $2.95 you'll be paying for a bottomless mug of it? I would say go ahead and get it. I don't know that the root beer alone is good enough to draw me to the restaurant, but it is very good, and the food is great too so you really can't lose. It could have used a little more carbonation, but other than that i was impressed with what the BJ's crew could throw together. It was sweet, creamy, and had a good vanilla and root beer flavor to it. My guess is that putting ice cream in it would be an excellent decision. I don't know that the root beer had as much of a Chicago influence as the food and atmosphere, but the only other Chicago style root beer i can compare it to is Goose Island, which was also very enjoyable. Oh, and i guess Berghoff also, but i find this stuff much better than Berghoff. Ultimately though, i think Chicago may be on to something with the way the citizens craft root beer. My official review is that BJ's gets 7 (seven) IBCs. I was impressed with it. Add a touch more carbonation and put it in a frosty mug and i think you've got a real winner there. There are a few BJ's locations here in the Valley of the Sun and several littered around California i know, but you'll have to check out their website to see if there is a BJ's near you. If so, take and evening and go enjoy some good food with some good root beer. I don't think you'll be disappointed. This is another one of the root beers my dear friend Richard brought me from North Carolina, although i am sure it's available several other places (just not here in Arizona). It's called American Fare Root Beer, and it's another generic brand from the good people at Kmart. The website on the can is for Kmart.com, but when i go there and type in "american fare root beer", this is what comes up. 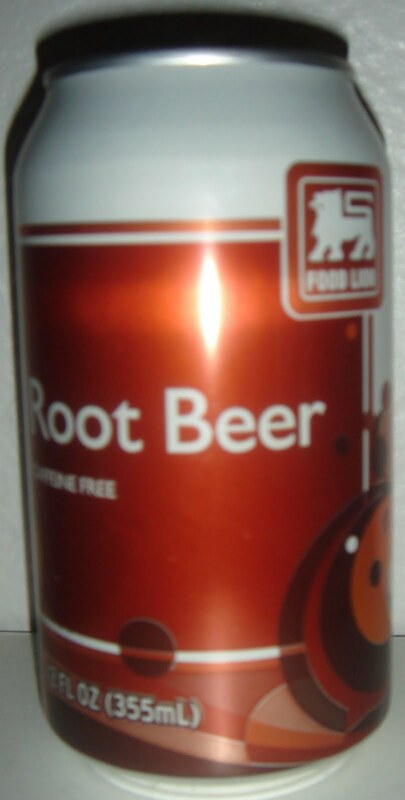 So basically, the information i am getting about this root beer is coming from the can. From what i can tell, it's made in Hoffman Estates, IL (a suburb of Chicago) and i have no idea how long it's been around. It was really nice of Richard to bring me all these root beers i don't have access to here. In repayment for bringing me 5 root beers, i brought him to a Mexican restaurant in someone's backyard, which in turn brought us both a raging case of explosive diarrhea and has subsequently been shut down. It's a shame too. I would have gladly risked another case of the runs for the chance to enjoy their delicious food. Seriously, it was really good. This root beer is typical of a generic. The 12 oz. can looks like it has a generic label, very few colors used and typical of those used by most generics. It's several shades of brown and cream colors with a little splash of blue in the logo. There are some decals of frothy root beer mugs running up the side with lots of little bubbles of carbonation making up the majority of the background. Not as dull and boring as some labels i've seen, but still nothing super special to get excited about. As far as taste is concerned, this is another copy of A&W, not unlike Parker's (which is Safeway's generic root beer). So in that sense, it's a good root beer and probably fairly inexpensive. But there is still something about it that makes it not all that great. Maybe it's just the psychological effect of knowing you're drinking a rip off that makes you think it's just not as good. So whatever it is, it's a good root beer, it's just not as good as the root beer it is intended to taste like. It has good carbonation and a distinct A&W flavor, but i swear near the end of it the flavor was fading fast and it was mostly just watery and sweet. My official review is that American Fare gets 6 (six) IBCs. It's probably a bargain because it's a generic and the price for a lot of this stuff is most likely quite low. However, it cannot be rated as highly as what it is intended to taste like because it simply is not quite as good. I think i rated Parker's as highly as i did A&W, and with good reason. Unfortunately, American Fare does not meet the same standard. 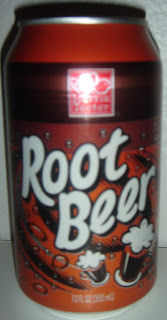 Still, it's not a bad root beer, and a 6 is considered better than average. So maybe it's something you might want to pick up if you're on a budget. Piggy-backing off my last post, this is the other root beer i got from Rocket Fizz on my root beer reconnaissance trip to California last summer, but i have i since seen it in select grocery stores. Langers is a company formed in Southern California (L.A. area) that produces natural fruit juices. It's a family company that has been around since about 1960. As it turns out, they also make a root beer (and perhaps other flavors of soda). To follow the trend of their fruit juices, this root beer is crafted from natural ingredients, meaning there is no high fructose corn syrup or artificial flavors in it. Sounds like another fly-by-night hippie operation, right? That was my first impression too. I figure if you want to make your juice that way, knock yourself out, but don't take something good like root beer and try making it "healthy". Next they are going to try and make cheese fries healthy. That just sounds awful. I want my cheese fries served with a heaping side of regret when i have stomach pains later. That's how you know they are working. The bottle and label are a pretty professional set up. The label is pasted on the brown 12 oz. bottle with a glossy sticker and doesn't look cheaply thrown together. There is nothing particularly spectacular about the label, but nothing i can say really repels me, besides the fact that it has a hint of "generic brand" look to it. But i can't complain too much. The company has been around for over 50 years now, so they seem like they have everything in order. Plus, they have an Egyptian Sphinx looking lion on their logo, so that's kinda neat. Right? Maybe not. I'm probably just grasping for something to say about the label. It's dull, but fine. I don't know that i would classify it as what i consider a "natural" root beer, which more often than not carries some pretty heavy implications that it tastes like hot garbage. To be honest, this stuff doesn't taste too bad. It's lacking in carbonation and definitely has a taste of honey to it, but overall i'm not completely put off by it. The label claims it contains vanilla extract (from Madagascar no less...) with cream and honey tones. Like i said, i can definitely taste the honey, and the vanilla is a nice touch. The root beer flavor could be more prominent, but overall i think these hippies did a decent job of not bottling piss and calling it root beer for the sake of being healthy. So for that i say well done. My official review is that Langers gets 6 (six) IBCs. Again, i hesitate to even call it a natural root beer, but if that is indeed what it is then it's one the better ones i have had (calm down Langers, you don't have very stiff competition in that department). I wouldn't say this stuff is worth going out of my way to purchase, but i will say it was certainly a pleasure to drink considering what i was expecting. So congratulations Langers, I don't hate you. Hey there root beer enthusiasts, here is your root beer for the day. It's called Myer's Avenue Red Root Beer, and it's brewed out of Naperville, IL by Cripple Creek Brewing. According to the website though, this root beer was first brewed in Cripple Creek, Colorado in 1893 beneath the majestic Cow Mountain, making this one of the older ones i've encountered. You can see details for yourself on their webpage if you care to go there, but this root beer has apparently been sitting silently for the last 100+ years while the world passed by unaware of its existence. So i am not sure how long it has been being produced on a wide scale operation. I do know that i came across this one on my California road trip last summer when i went looking for new root beers. I visited a place in Thousand Oaks (west of Burbank) called Rocket Fizz. It's a retro candy store with tons of old sodas, candy, and so much more from my childhood, and even long before I was born. I even met the owner (I think his name was Rob) who was really nice and very cool about answering my root beer questions. He even gave me a free bottle of Spruce Beer, which is completely white and opaque and tastes like liquid Vicks Vapo-rub. Rob runs a cool store there in Thousand Oaks and is expanding pretty aggressively. Since i talked to him last summer, at least 3 to 4 more stores have opened in California and across the country, including one here in Phoenix now. He asked me if i wanted to open a franchise, but i'm terrible at business so i declined. If you're interested though, there is franchise info on the Rocket Fizz website. This root beer comes in a clear glass 12 oz bottle, which i have little to no luck with in most cases, and has a really cool label. I think Cripple Creek did a good job on this one. It looks like an old stock certificate or bank note and is very detailed but still simple. The color tone selection gives it the sepia feel of old paperwork or photographs and the font style and set up just work well. Well done on the label. If nothing else, you get extra points for presentation. The website and label both mention how root beer this is flavored with cinnamon, and it's definitely noticeable. It works very well though, and i actually really like the taste. To be completely honest, it doesn't taste all that much like root beer, but it's not bad still. My wife has been craving french toast a lot lately, so we have been eating it more regularly recently, and to me this root beer tastes like french toast. It's lightly sweet, has good carbonation, and isn't overpowering or unpleasant at all. Again, i would like more of a root beer taste in it, but i can't complain with the flavor they are giving me. A refreshing change from the spate of regular old root beers i have been drinking lately. The website boasts this root beer is responsible for the famous "black cow" root beer float. So if you try this one, maybe you should drop a scoop of ice cream in it and see how that treats you. My official review is that Myer's Avenue Red Root Beer gets 7 (seven) IBCs. I almost gave it an 8, but kinda hoped for more of a root beer flavor. It's definitely better than many of the mundane root beers out there though. So stop by a Rocket Fizz and grab yourself one. The Old Town Root Beer Company has stores in different locations around California, most popularly in San Diego, Temecula, Chico, and Barstow. I think there are a few more also. They make a root beer with their label as well as a few other flavors. This is actually one of the root beers i had on my list last summer when i went to California with my wife and a few friends on a root beer round up. Unfortunately, we didn't get out to Temecula, the closest place that had these. But luckily i have a great street team who is willing to do root beer hunting for me all over the U.S. A buddy of mine found this at Cost Plus World Market here in Mesa. I swear i looked there before, but it was a while ago. Anyway, i am glad he picked one up for me, but from what i have read online it might have been worth the drive to actually go to the store in Temecula and get it myself. I tried to find an official site for them but had a little trouble. There is even a website listed on the bottle (www.oldtownrootbeer.com), but when i type it in the browser it just takes me to google and gives me a bunch of links relating to it. There is an official Facebook page for the store in Temecula, but i morally oppose Facebook so i wouldn't recommend anyone spending too much time on that page. But from what i have read on other sites about the store in Temecula is that it sells over 800 kinds of soda, including 99 kinds of root beer, and i think they also serve food there, like a little restaurant with a big soda store attached or something. I don't know the details, but it makes me want to go see this place for myself. If there really are 99 different kinds of root beers there, it might work out that there are one or two i haven't tried. The bottle is a pretty standard brown glass 12 oz. bottle and the label is fairly well made. The logo is simple, yet professional. It almost looks like it's designed to be a wave, but it doesn't look like a wave. There is a big foamy mug of root beer wrapped in text against a white and red background. It's tasteful. As mentioned above, they list a website on the label, but i am wondering if it used to be up and running but it isn't now. Regardless, there is no lack of presence on the web. I found plenty of links relating to the stores/restaurants (whatever they are) on google. As far as taste goes, it's not a bad root beer. Not at all. I feel like it's a recycled taste though. Not completely unoriginal, but not anything to get excited about either. To me it tastes like a lot of other root beers, but the first comparison that came to mind was Abita. There is a bit of a honey taste, not much, followed with a sugary root beer flavor (they use cane sugar) with a vanilla after taste. It's not a bad root beer at all, but it's not quite my cup of tea. I feel like the flavor fades really quick and all i am left with is a sugar taste in my mouth. It's not as bad an effect as Olde Rhode Island, but it's similar. Anyway, that's about i have to say about that. My official review is that Old Town Root Beer gets 6 (six) IBCs. This is a bit of a short review, i know, but i feel like i don't really have much to say about this one. Like i said, i feel like it's a taste i've drank several times already. It's not bad, and i still do want to visit one of their stores (maybe in San Diego). I just wouldn't rush out and buy a case of these. Get one with a burger, sure. I bet it goes good with ice cream too. But it's not going to be one i keep stocked at home. That's all. Hi all! Happy New Year! I feel like we need to catch up and chat a bit. How are you? How are things? That's great. Now let's talk about me some more. I am doing fantastic, with a really exciting way to start the new year. I was lucky enough to be able to take part in a study abroad for my school program and had an opportunity to go to Dubai for two whole weeks. Dubai is literally the other side of the world from Phoenix, AZ. There is an 11 hour time difference, so when i got in this morning 10:30 AM Monday morning and skyped my wife, i was talking to her at 11:30 PM Sunday night. In other words, i was talking to her... FROM THE FUTURE! Anyway, i wanted to send out a request in regards to this blog to ask anyone who knows anything about this region (or that of London, UK as that is our connecting flight) if they know of any root beers i can get in either of these two locations. I was actually lucky enough to find one here called Zest-o in an enormous store that is probably best comparable to Walmart. So if anyone knows of any others i might want to track down, i would be appreciative. This was sparked by a reader comment from someone in the UK. He mentioned the lack of root beer variety there and named a local brand, but going back through the comments i was unable to find the one he left. I know i don't respond much to comments, but i do appreciate them for suggestions and tips. Not so much for criticism, though i get plenty of that also. I don't much care what those people think anyway, mostly because i am far superior to all of you, but by all means, please don't let that discourage you for telling me your dislikes about myself or the reviews i write. I welcome them. One in particular that i thought was quite amusing was on the Walmart Root Beer review (warning: there is quite a bit of swearing in it). I had a good laugh at it though. He must have been really proud of himself for that one. Anyway, any hints would be much appreciated. I am also going to start a drastically different blog about my short time here called Two Weeks in Dubai. It will probably be more... journalistic? Don't hold me to that too closely though, as i am not a journalist, i'm a root beer expert.